There is hardly another disease with so profound an impact on all levels of life of a human being as cancer. Cancer is a disease with multi-factor aetiology, uncertain prognosis and course of the illness and often involves multi-morbidity. Cancer accounts for a quarter of all deaths and is the number one cause of death for people aged 45-64 in an increasing number of EU countries, overtaking cardiovascular disease. In 2012, it was estimated that 3.45 million new cases were diagnosed, and more than 1.75 million people died from cancer in Europe. [1. cancer in numbers] A 2013 study estimated that cancer cost the EU €126 billion in 2009, with health care accounting for €51 billion (40%). Cancer is therefore a major challenge for any health system. Most of the costs are caused by the treatment of the primary disease (surgery, chemo-therapy, radiation) and do not include the huge efforts necessary to cover the secondary problems following the diagnosis of cancer. In an analysis of the US National Cancer Institute in 2010 the authors stress that in addition to the development of new treatment technologies much greater effort has to be spent in prevention, “to advance the science of cancer prevention and treatment to ensure that we’re using the most effective approaches,[…. ]which is especially important for elderly cancer patients with other complex health problems[…]” [3. Cancer costs at least $158 billion..]. The increasing popularity of Complementary and Alternative Medicine (CAM) among cancer patients has been well documented. A survey among 956 cancer patients in 14 countries  demonstrated that 35.9% of them use some form of CAM (range among countries 14.8% to 73.1%). According to a systematic review  the prevalence of any CAM use (since cancer diagnosis) in children with cancer ranged from 6% to 91%. Herbal medicines (Western, Ayurvedic and Traditional Chinese) are the most commonly used CAM therapies, together with vitamins/minerals, homeopathy, mistletoe, acupuncture, spiritual therapies and relaxation techniques. The majority use CAM to increase the body's ability to overcome cancer, to improve physical and emotional well-being, to help with side effects of conventional treatment, to feel more ‘in control’ of their situation, to maintain a positive attitude towards the future and to adopt and maintain an active coping life-style. Many seem to benefit from using CAM. In addition to the clinical symptoms and the physical/pathophysiological impact of the disease, the receiving of the diagnosis of cancer is always a very frightening experience and many people remember the exact moment of hearing this devastating news. The experience can cause shock, trauma, depression, fear and anxiety and the feeling that one’s life is spiralling out of control. In this situation the person can often feel like their body has let them down and they can lose confidence in themselves and their future. After the initial shock many patients develop a desire to look more deeply into their health in general and to find meaning in their lives as a whole. This is the time when many cancer patients will seek to complement their conventional care with CAM approaches. Cancer is a disease process in which healthy cells have stopped functioning and maturing normally. The normal cycle of cell formation and death is interrupted, and the newly mutated cancer cells begin to multiply uncontrollably, no longer functioning as an integral part of the body. As the process of mutated cell growth occurs, a healthy immune system will recognize this uncontrolled growth and will elicit a response by sending macrophages to the region for cellular phagocytosis of the mutated cells. Also, the immune system promotes the release of endogenous compounds to inhibit the uncontrolled cell growth. This process occurs almost daily in healthy humans and animals. Conventional medicine considers cancer to be a localized disease and believes that if the primary tumour can be eliminated early by destructive means – surgery, radiation or chemotherapy – the patient will be cured. This is why for many years conventional medicine’s approach to the treatment of cancer has been focused on three traditional methods – surgery, radiotherapy and chemotherapy. CAM health professionals, however, consider cancer to be a systemic disease, that is, a disease of the whole organism. They look for the cause of the 'breakdown of health' resulting from a deficiency or weakness in the immune system, the mental and emotional state of the patient, and make an analysis of the patient's overall health, strength and vitality. CAM health professionals take an individualised approach, designed to support and enhance the body’s natural defences against cancer. This approach is non-invasive and designed to treat the whole person, rather than the site of the cancer. Using an analogy, one could say that, whereas modern western oncology is focused on destroying the weed, complementary healthcare concentrates on the soil the weed grows in and on making the soil as inhospitable as possible to the growth and spread of the weed. The expanse of a tumour may obstruct vital pathways, might cause pain and other symptoms. This is the realm of biomedical interventions which aim to reduce the tumour mass. However, several studies have shown that CAM can also contribute to these interventions (Schad et al, 2011; Orange et al, 2010; Seifert et al, 2011). The vitality of cancer patients is often reduced whether this is caused by the disease itself or from the side effects of primary treatments. Most CAM methods have a high potential to stimulate salutogenesis i.e. the ability of the body to regain balance. The beneficial effect of CAM in reducing conventional treatment side effects is due to this potential (Piao et al, 2004; Ezzo et al, 2006; Kassab et al, 2009). Pain is a major problem with impact on quality of life. Several CAM methods have shown high potential to reduce cancer pain (Paley et al, 2009; Fellowes et al, 2004; Wilkinson et al, 2008). Most patients use CAM as a response to psychosocial needs as well as a need to actively cope with the disease and enhance overall quality of life. The influence of psychological response on cancer survival and the importance of psychological intervention have been highlighted by several cohort studies (Falagas et al, 2007). A hopeless/helpless response to diagnosis exerted a significant negative effect on disease-free survival for up to 10 years among a cohort of breast cancer patients (Watson et al, 2005). Many supportive approaches such as psychotherapy and other psychological procedures exist to help people during this difficult time of adjusting to a life-threatening illness (Blake et al, 1999; Chida et al, 2008; Dégi et al, 2006). Cancer, more than almost all other disease, has a severe impact on the person´s individuality in most patients. Ordinary life stops for the duration, the essential things in life are put into a new perspective and often re-prioritised. The ability to cope is reduced. In this situation usually the patient experiences the necessary primary biomedical interventions exerting power over the own individuality. Depression often follows. In this situation CAM has a very high potential for improving the patient´s self-confidence, the ability to cope and the will to again take control of their life within the disease (Carlsson et al, 2004; Stephen et al, 2007). By and large, CAM has the potential to provide a more holistic approach to care that embraces patients’ psychological, emotional and spiritual needs as well as supporting the physiological. The emphasis is placed on supportive listening and explaining, professional help with social re-integration, help with regaining emotional balance, and a positive perspective on their future life. In addition, advice on lifestyle, diet and self-help will usually be provided by CAM health professionals. Wherever the boundaries of conventional care are drawn, there may always be some patients who seek more holistic care by going outside the orthodox system. To counter a sense of passivity sometimes experienced in the acceptance of conventional treatment. Patients want to make active choices. Using CAM provides an avenue for self-help and enables them to regain a sense of control in the face of an uncertain future. In the Evans study patients reported experiences of poor communication with oncologists, revolving around lack of time to talk in depth, difficulty in ‘making a connection’ with clinicians and finding it hard to formulate and ask questions. CAM health professionals provide the time patients need to express themselves and for good communication. Patients report an improvement in their subjective state of health after using CAM therapies, experiencing an increase in energy, better sleep quality and a reduction in fatigue and depression. CAM treatments relieve side effects of conventional treatments: reduction of nausea, vomiting, skin reactions, pain and analgesic medicines but also a reduction in the number of hospitalizations for serious side effects. Patients may perceive conventional treatment as limited to the disease and not geared to their individual needs. In addition to the highly developed oncology programmes, many patients want and need psychological, emotional or spiritual support and they value the more individualized ‘whole-person’ approach with an emphasis on self-healing that typifies many CAM therapies. They report a reduction in stress, depression, anxiety and panic attacks, feel more able to relax, and experience ‘peace of mind’, greater mental clarity and a positive attitude on their future life through using CAM. While improving quality of life is the major rationale for CAM use, there is a definite undercurrent of expectation, particularly among the younger patients, that some therapies might have an anticancer effect (prolongation of remission periods) and slow/stagnate tumour growth (prolongation of survival periods), boost the immune system, making it easier to overcome the disease. Thereare several hospitals and clinics in Europe that run an integrative cancer care service . In particular anthroposophic hospitals have broad experience providing mistletoe therapy and a multi-professional team approach for cancer patients. Referrals maycome directly from healthcare professionals within related cancer services and research suggests some patients want their treatment choices valued and approved by their oncologists. Communication on the use of CAM modalities is a very difficult issue in oncological care. Often, patients do not tell their oncologists that they are using CAM alongside mainstream medicine. The CAM treatments most often used in these hospitals include anthroposophic medicine (mistletoe therapy), homeopathy and acupuncture. In addition to these methods other CAM therapies used in outpatient settings include nutrition, mind–body therapies, psychological therapies, physical and ‘hands-on’ therapies, herbal medicines. These and other therapies are also commonly used by patients in a complementary fashion in private consultations with CAM health professionals. CAM therapies should never be used as a replacement for conventional cancer care or as a reason to postpone seeing a doctor about any problem. There is limited scientific evidence suggesting that some CAM approaches may be useful in managing some symptoms of cancer and side effects of treatment. At present, there is no convincing evidence regarding CAM use in preventing or curing cancer. Before using any CAM therapy, people who have been diagnosed with cancer should talk with the doctors who treat their condition—to make sure that all aspects of their cancer care work together. Cancer patients need to make informed decisions about using CAM. 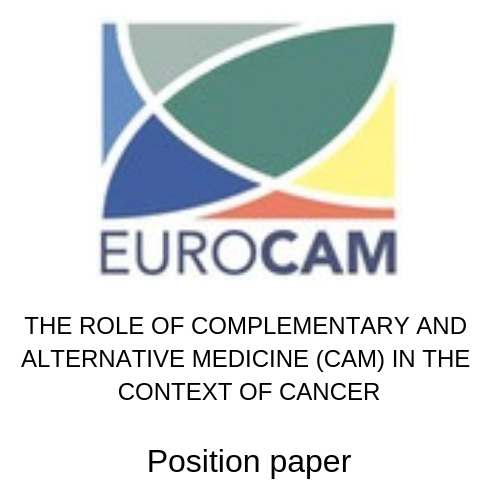 EUROCAM takes the position that Complementary and Alternative Medicine approaches can be safely used as a complement to standard cancer care, in particular to mitigate disease symptoms and side effects of conventional treatment. It also helps provide social, psychological and nutritional guidance for patient re-integration and rehabilitation. A multidisciplinary approach is of paramount importance. CAM should never be used as a replacement for standard cancer care. Supportive primary treatment for tumour reduction. Supportive treatment of cancer symptoms (in particular vomiting and pain) and symptoms due to primary tumour-reductive treatments. Supportive treatment for anxiety, fear, depression. Supportive treatment for social re-integration, coping and active life-management. Advise in life-style changes, nutrition, and team-building with several professional groups. Offering a positive prospect for the future. In addition, CAM has the potential for the primary and secondary prevention of cancer through counselling on healthy lifestyle, nutrition and supporting the human power of ‘salutogenesis’  throughout life. Beuth J, Moss RW (2006). Complementary Oncology – Adjunctive Methods in the Treatment of Cancer. Thieme, Stuttgart, New York. Bishop FL et al. (2010). Prevalence of complementary medicine use in pediatric cancer: a systematic review. Pediatrics, 125:768-776. Blake-Mortimer J et al (1999). Improving the quality and quantity of life among patients with cancer: a review of the effectiveness of group psychotherapy. European Journal of Cancer, 35:1581–1586. Carlsson M et al (2004). Evaluation of quality of life/life satisfaction in women with breast cancer in complementary and conventional care. Acta Oncologica, 43:27-34. Chida Y et al (2008). Do stress-related psychosocial factors contribute to cancer incidence and survival? Nature Clinical Practice Oncology, 5:466-75. Ezzo JM et al (2006). Acupuncture-point stimulation for chemotherapy-induced nausea or vomiting. Cochrane Database Systematic Review (2):CD002285. Fellowes D et al (2004). Aromatherapy and massage for symptom relief in patients with cancer (Cochrane Review). The Cochrane Library, Issue 3. John Wiley & Sons, Chichester, UK. Horneber M et al (2008). Mistletoe therapy in oncology. Cochrane Database of Systematic Reviews 2008, Issue 2. Art. No. : CD003297. Kassab S et al (2009). Homeopathic medicines for adverse effects of cancer treatments. Cochrane Database of Systematic Reviews 2009, Issue 2. Art. No. : CD004845. Kienle GS & Kiene H (2010). Influence of Viscum album L (European Mistletoe) Extracts on Quality of Life in Cancer Patients: A Systematic Review of Controlled Clinical Studies. Integrative Cancer Therapies, 9:142-157. Mansky PJ & Wallerstedt DB (2006). Complementary medicine in palliative care and cancer symptom management, Cancer Journal,12:425-431. Molassiotis A et al (2007). The management of cancer-related fatigue after chemotherapy with acupuncture and acupressure: a randomised controlled trial. Complementary Therapies in Medicine, 15:228-237. Piao BK et al (2004). Impact of complementary mistletoe extract treatment on quality of life in breast, ovarian and non-small cell lung cancer patients. A prospective randomized controlled clinical trial. Anticancer Research, 24:303-309. Pilkington K et al (2006). Homeopathy for anxiety and anxiety disorders: a systematic review of the research. Homeopathy, 95:151-162. Richardson J et al (2006) Hypnosis for procedure-related pain and distress in paediatric cancer patients: a systematic review of effectiveness and methodology related to hypnosis interventions. Journal of pain and symptom management, 31:70-84. Richardson J et al (2005) Aloe vera for preventing radiation-induced skin reactions: a systematic literature review. Clinical oncology (R Coll Radiol) 17:478-484. Seifert G et al (2011). Anthroposophic supportive treatment in children with medulloblastoma receiving first-line therapy. Journal of pediatric hematology/oncology, 33:105-108. Tasaki K et al (2002) Communication between physicians and cancer patients about complementary and alternative medicine: exploring patients' perspectives. Psycho Oncology, 11:212-220. Taixiang W et al (2005). Chinese medical herbs for chemotherapy side effects in colorectal cancer patients. Cochrane Database Systematic Review (1):CD004540. Wilkinson S et al (2008). Massage for symptom relief in patients with cancer: systematic review. Journal of Advanced Nursing, 63:430-439. Luengo-Fernandez R et al. Economic burden of cancer across the European Union: a population-based cost analysis. Lancet Oncol. 2013 Nov;14(12):1165-74. Molassiotis A et al (2005). Use of complementary and alternative medicine in cancer patients: a European survey. Annals of Oncology 16: 655–663. Bishop FL et al (2010). Prevalence of complementary medicine use in pediatric cancer: a systematic review. Pediatrics, 125:768- 776. Integrative oncology centres in Europe include Humlegaarden (Humlebaek, Denmark); Vidarkliniken (Järna, Sweden); Bristol Cancer Help Center (Bristol, UK), Royal London Hospital for Integrated Medicine (London, UK); Gemeinschaftskrankenhaus Herdecke, (Herdecke Germany), Gemeinschaftskrankenhaus Hafelhöhe (Berlin, Germany), Filderklinik (Stuttgart, Germany), Paracelsus Krankenhaus (Öschelbronn, Germany), Hufeland Clinic (Bad Mergentheim, Germany); Klinik für Komplementäre und Integrative Medizin in der Zentral-Klinik Essen (Essen, Germany), Lukas Klinik (Arlesheim, Switzerland), Ita-Wegman Klinik, (Arlesheim, Switzerland).